Sell components (or mobile phones) . When you press the first icon in toolbar, software will show 'Sell computer system' screen. On the left panel of the screen, product categories will be enabled. ... but you can easily add more product categories. 1. To sell a system configuration, choose desired products, or select from System name list already created system configuration. 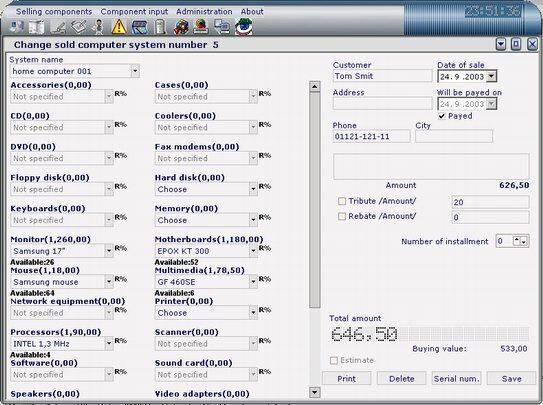 After each change, price is recalculated and shown on the screen, and when you select some component from list you will see the number of available components in your storage. 2. You can change number of components for each group by clicking on group name (when some component is selected) or you can search trough component list (when there is no component selected). 3. For each customer you can specify name, address, city, phone, and memo associated with this sale. 4. Each sold system is registered in database with date of sale and notification if customer has paid. If not, you can specify date when bill will be paid. - GST, PST and/or discount amounts. Price will be recalculated and shown on the screen. If you check checkbox sum you enter is in % of total sum, but if you do not check check box, you may enter amount. 6. You can add rebate for group of components, just click on letter 'R' and enter rebate amount. 7. If you check Estimate button, in database will be saved estimate bill. 8. To save generated system in database, press the button 'Save', or if it's not longer needed, 'Delete' it. � Each bill can be printed. You can specify text of your guarantee (Setup -> Receipt text) for sold system and this will be printed on receipt. This way your customer gets printed list of integrated peripherals in his computer. � Now you can use installments to sell your computer systems. You can choose number of installments as you wish. Payed installments are checked. 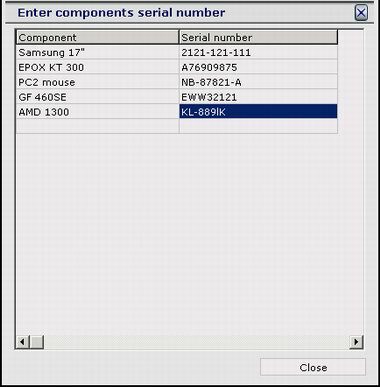 � You can add serial number of components that you want to sell, by clicking on 'Serial number' button.